1. Status of Candidature of Candidate Who applied for Recruitment against Scouts & Guides Quota 2013-14 in Malda division. 2. 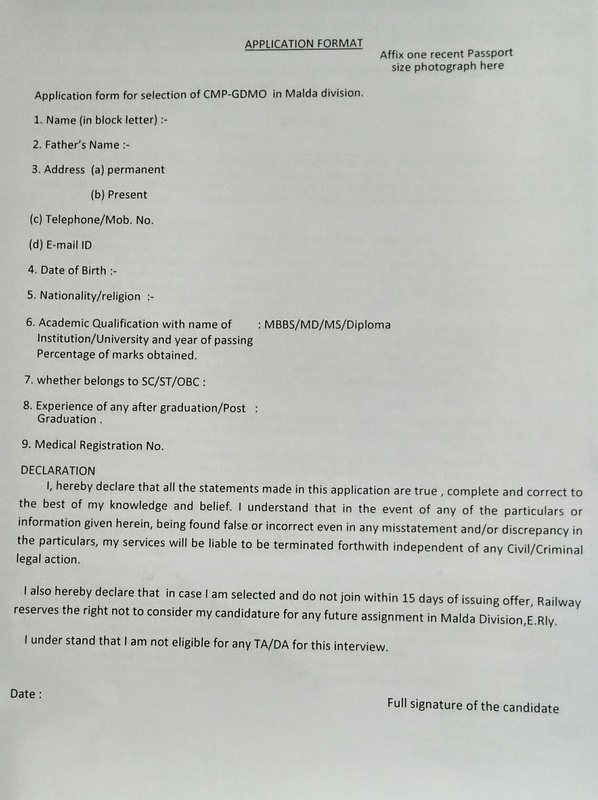 Status of Application received against Sports quota 2014-15 of Malda Division. 3. Recruitment against Scouts &Guides Quota for the year 2013-2014 in Malda Division. 4. Position On Compassionate Appointment cases as on 23/2/2016. 5.Status of Candidature of Candidate Who applied for Recruitment against Scouts & Guides Quota 2014-15 in Malda division. 6. RESULT FOR WALK-IN INTERVIEW FOR PARA MEDICAL STAFF OF MALDA DIVISION. 7. PUBLICATION OF RESULT FOR RECRUITMENT AGAINST SCOUTS & GUIDES QUOTA 2014-2015 IN MALDA DIVISION. 8. 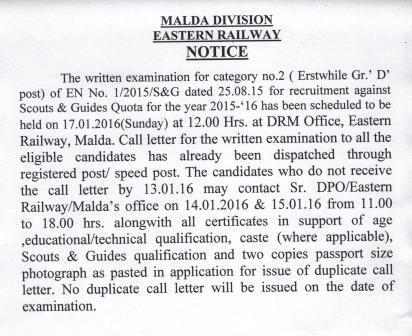 RECRUITMENT AGAINST SCOUTS & GUIDES QUOTA FOR THE YEAR 2014-15 IN MALDA DIVISION. 9. RECRUITMENT AGAINST SPORTS QUOTA FOR THE YEAR OF 2014-15 IN MALDA DIVISION. 12. APPLICATION FOR ENGAGEMENT OF HONY. VISITING SPECIALIST DOCTOR AT DIVL.RLY. HOSPITAL, MALDA. 14. Result of the written test in connection with the recruitment against Scouts &Guides Quota for the year 2015-2016 in Malda Division. 15. RECRUITMENT AGAINST SCOUTS AND GUIDES QUOTA 2015-2016 and RECRUITMENT AGAINST SPORTS QUOTA 2014-2015. 16. Eligibility list of candidate for sports trial of Malda Division. 17. (a)Result of Recruitment against Scouts & Guides Quota for the year 2015-2016 in Malda Division. (B) APPOINTMENT AGAINST SCOUTS & GUIDE QUOTA IN MALDA DIVISION. 18. Result of Recruitment against Sports Quota for the year 2015-2016 in Malda Division. 19. POSITION OF COMPASSIONATE APPOINTMENT CASES upto 11.08.2016. 20. WALK-IN INTERVIEW FOR MEDICAL STAFF OF MALDA DIVISION. 21. A walk-in interview will be organized for filling up vacancies of Full Time Staff Nurse & Radiographer on Contract Basis at Divisional Rly. Hospital, Malda , Eastern Railway. 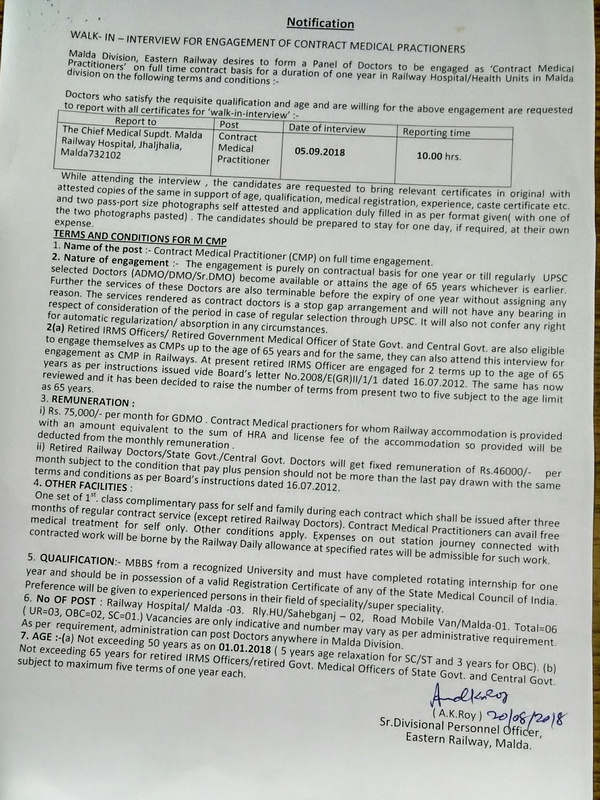 23. walk in interview for engagement of Contract Medical Practioners in Malda Division.